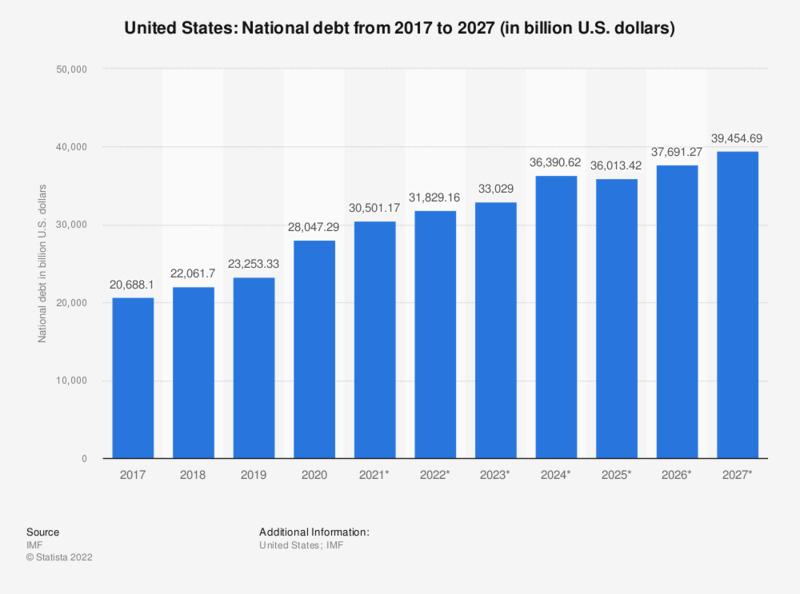 The statistic shows the national debt of the United States from 2012 to 2017, with projections up until 2022. The amount of the debt of the United States amounted to around 20.5 trillion U.S. dollars in 2017. National debt in the United States is a topic of much debate and controversy, primarily due to large amounts of unnecessary spending. Despite the fact that the United States had the highest gross domestic product (GDP) in the world in 2016, along with being one of the most developed powerhouses in the world, the country suffers in many economical aspects. When analyzing the country’s imports and exports, the United States has recorded a trade deficit for more than a decade as of 2015, meaning that its imports exceeded its exports every year. However, despite being significantly affected by the world economic crisis in 2008, the country’s trade balance noticeably improved in 2009, almost halving the country’s total trade deficit. An economical aspect that did not improve during the world economic crisis was the country’s unemployment rate. The number of unemployed in the United States increased greatly in 2009 and continued to rise in 2010, however finally stabilized in the following years and has since declined yearly. When considering the total population of the United States, which amounted to roughly 322 million in 2015, a large percentage of citizens, who are capable of work, have been left without a job for roughly 7 years. The figures have been rounded for the sake of a better understanding of the statistic. U.S. population: How many pieces of Trident Layers chewing gum have you chewed in the last 7 days?